Since I’m not a sports fan, I’m kind of surprised that I’m actually looking forward to going downtown to a baseball game later today. Usually I’m more excited about going out to dinner after the game. But this time my interest has been piqued by a research opportunity. All week my story has been building to a trip my lovers and her kids take to a baseball game. When I was trying to come up with an idea for their first outing as a foursome, a baseball game came to mind for a couple of reasons. 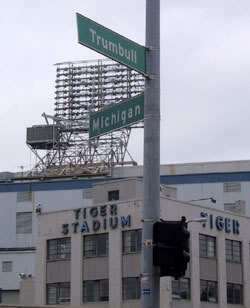 The time of year is right, and Al & I used to take our boys down to Tiger Stadium and they loved it. 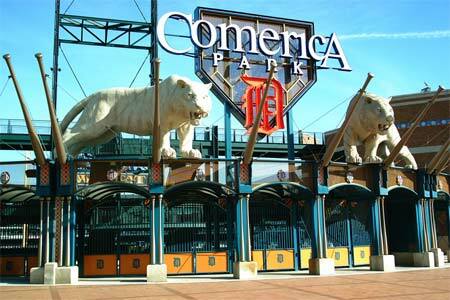 Tiger Stadium is gone, and I never much paid attention to the kid stuff at the new ballpark. Our boys were grown when it was built, but I’ve seen the miniature baseball Ferris wheel, and I think there’s a carousel with tigers instead of horses. I can’t imagine what they charge for rides on those things. I’ll also have to check out the souvenirs, because Mike and Tim always took great delight in choosing something to take home. The kid food is likely still ball park franks but the vendors have gotten a lot fancier than peanuts and Cracker Jacks. I need to pay attention to what the kids around me are eating. For once I’ll buy a program (mystifying all my friends and particularly my husband) so I spell the players’ names right. I know I could look this stuff up online, but it’s way more fun to gather the artifacts. And I didn’t plan it this way, but it seems a good omen that the baseball scene comes right after the scenes I’m writing today, because of course I’m going to get my 1000 words in before we go to the game. This sounds like fun. Though we seldom get to a major league park, we try to go at least once a year to the minor league park just to our south.